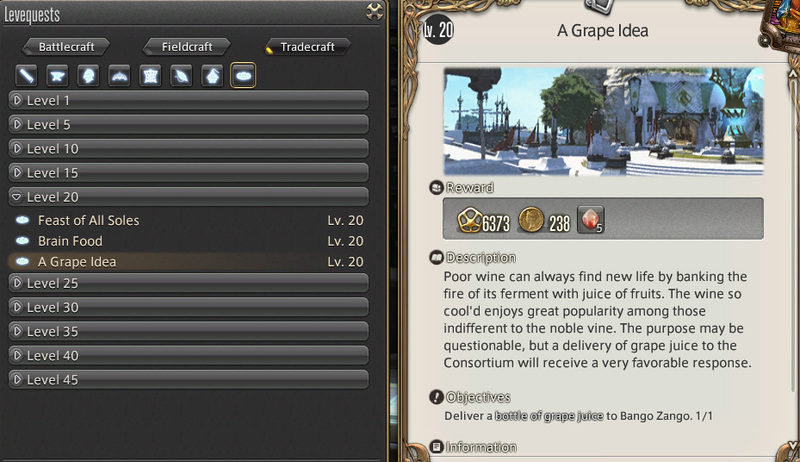 Home » FF14 A Realm Reborn » Level 50 Culinarian: Where Did My Inventory Space Go?! After I finished leveling my Miner to 50 (yes it took awhile, the last level I did Leves in Mor Dhona) and spending some time on my Goldsmith making some gear to sell on the Market, I decided to start another crafter. Originally I wasn’t going to touch Culinarian, but then I learned about two very useful skills you can pickup a long the way: Hasty Touch which is very useful as part of the Inner Quiet > Hasty Touch/Tricks of the Trade > Mend cycle that can help you HQ most higher durability items and Steady Hands II, which buffs Hasty Touch taking it from a 50% chance, to an 80% chance (Steady Hands I only buffs it to 70%) which further helps when HQing something. A couple things to note about this DoH class: You will want to clear out at least 3 tabs of inventory, possibly more if you decide to go a different route than I did. Even when I tried to focus on items that took minimal mats to create, I would still end up almost maxing out my inventory. While it’s a good rule of thumb to craft most stuff (at least below 30) at least once for the experience bonus, I would suggest avoiding that this time around, instead try to focus on 1-2 things and milk them for all you can. I used Leves again and there were three, with the third one ending up making the last few levels go by really quickly. 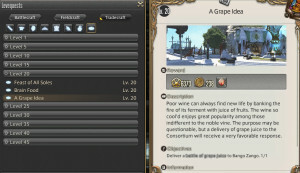 All leves are found in Limsa and are turned into an NPC near the Limsa Aetheryte Crystal. This first leve is unlocked at level 20, it’s not that great but it’s useful for a few levels at least (or longer, depending on your access to mats). My goal with the leves was to hit the ones which required stuff with either the least number of mats, or stuff that was easier to HQ. This second leve is unlocked at level 30, while you may not be able to jump on this one asap, I found that it wasn’t too difficult to HQ Cornmeal, but I had access to the Goldsmith cross class abilities, like Flawless Synthesis and Manipulation. This leve is very useful for a rather long time, however it does require a lot of crafting. This one IS a leve that allows you to “turn-in” 3 times, for a total of 140k~ experience (assuming everything is HQ). Not that if you do aim for this leve, you will be crafting a TON of cornmeal I ended up with something like 700 NQ cornmeal when I was finished with this leve. The last leve I used is unlocked at 40, and I didn’t even notice it first, but on a whim I checked out the mats for Apple Juice (Juice tends to have 1-2 mats, which is what I was aiming at), and not only did it only have one mat (6x Mirror Apples), the Market had stacks and stacks of them both NQ and HQ. YMMV though, and that did cost me a bit (I would estimate about 40k-50k spent on Mirror Apples). While it did take awhile to craft 9 HQ Apple Juices (this is a 3x turn-in leve!) the experience — and gil — was more than worth it. For reference, you get about 1000-1200 gil per turn in so over 3k for full HQ mats, which helps take the sting out a bit from the expensive HQ Mirror Apples. So, like the title mentions, my inventory seemed incredibly small while leveling my culinary skills, there are very few items that take less then 5-6 different base items. The other issue was the number of stuff I had to run to the Market to acquire. I imagine this might be a bit alleviated for those who leveled a Botanist up, but personally my Miner is good enough for me. I can’t imagine leveling a second gatherer class, although I might take Botany to 20 for the wards. 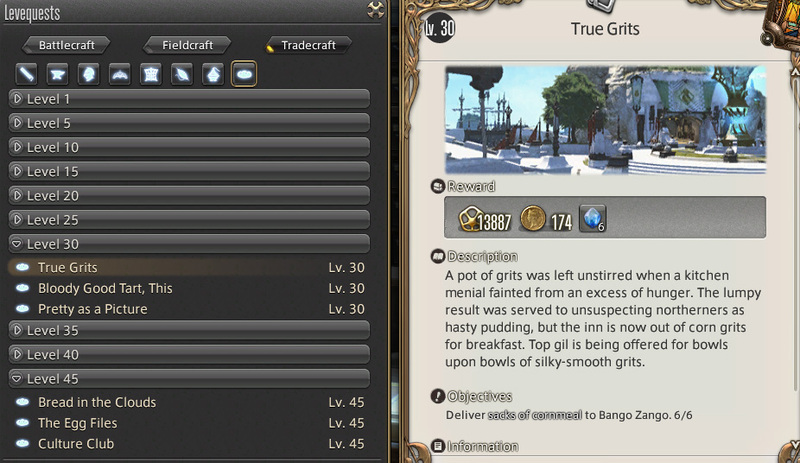 Culinary Class quests were somewhat underwhelming, I loved the Goldsmith ones, but these ones just didn’t catch my attention. Though I didn’t originally plan to level a Culinarian, so that might be an extension of that. I do love the Culinary class gear, though I don’t currently have the gil to blow on it, heh. Because I have access to a 50 Goldsmith and a large number of mats from leveling my mining, I was able to keep my Culinarian outfitted in HQ jewelry (and occasionally glasses) throughout the leveling process, this was extremely useful as you gain most of your CP off jewelry, I hit 250+ at a relatively low level and ended up at 310 at 49~50 which was very useful in HQing stuff. 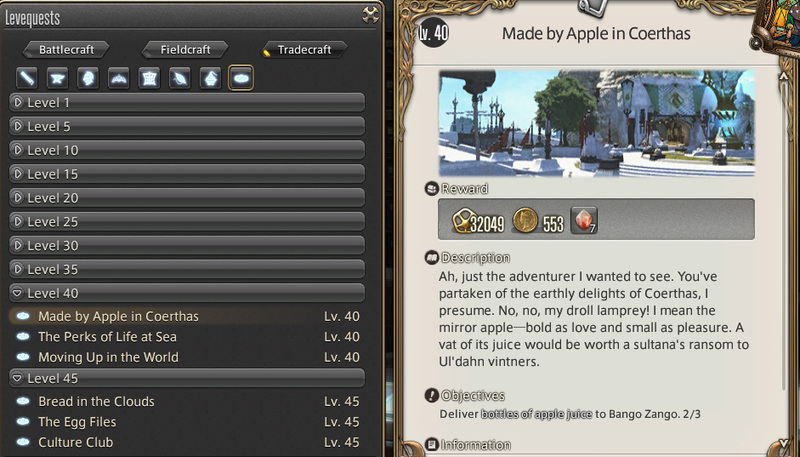 I’m actually quite happy that the crafter I chose first — goldsmith — has turned out to have amazing synergy with other crafters. From the skill “Flawless Synthesis” to “Manipulation”. My next crafter is likely going to be either a Weaver, or possibly a Leatherworker — I’m aiming towards Weaver because I want to craft base sets of HQ crafting gear to make leveling future crafters easier. My end goal is to get one of every crafter to 50, because I’ve found them to oddly be fun. DoW – I’ve discovered that, while I really enjoy the fighter classes, I absolutely cannot stand FATE grinding for very long, so it’s put a small damper on my plans to level up some casters — I really want to see what healing is like in this game, but FATE grinding is just so incredibly boring. 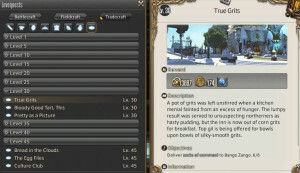 This entry was posted in FF14 A Realm Reborn and tagged culinarian, DoH, ff14 by Nick. Bookmark the permalink.